Sleeping is something we all do and all need for a healthy life. Taking a nap gives our body time to recover from a long day. God never sleeps so He is always watching over us when we’re awake or sleeping. Rest is good but when you get into the habit of always sleeping and not pursuing work to make a living that is laziness. Sleep well, but don’t do it too much because you will end up in poverty. 1. Psalm 121:2-5 My help comes from the Lord, the maker of heaven and earth. He will not let you fall. Your guardian will not fall asleep. Indeed, the Guardian of Israel never rests or sleeps. The Lord is your guardian. The Lord is the shade over your right hand. 2. Proverbs 3:24 When you lie down, you will not be afraid. When you rest, your sleep will be peaceful. 3. Psalm 4:7-8 But you have made me happier than they will ever be with all their wine and grain. When I go to bed, I sleep in peace, because, Lord, you keep me safe. 4. Psalm 3:3-6 But you, Lord, protect me. You bring me honor; you give me hope. I will pray to the Lord, and he will answer me from his holy mountain. I can lie down to rest and know that I will wake up, because the Lord covers and protects me. So I will not be afraid of my enemies, even if thousands of them surround me. 5. Proverbs 1:33 but whoever listens to me will live in safety and be at ease, without fear of harm. 6. Psalm 16:9 Therefore my heart is glad and my tongue rejoices; my body also will rest secure. 7. Isaiah 26:3 You will keep in perfect peace those whose minds are steadfast, because they trust in you. 8. Philippians 4:7 And the peace of God, which transcends all understanding, will guard your hearts and your minds in Christ Jesus. 9. Proverbs 19:15 Laziness brings on deep sleep, and the shiftless go hungry. 10. 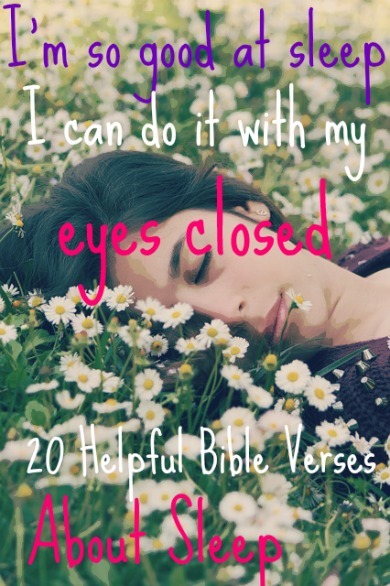 Proverbs 20:13 If you love sleep, you will end in poverty. Keep your eyes open, and there will be plenty to eat! 11. Proverbs 26:14-15 Like a door on its hinges, a lazy man turns back and forth on his bed. Lazy people are too lazy to lift the food from their plate to their mouth. 12. Proverbs 6:9-10 How long will you lie there, you lazy person? When will you get up from sleeping? You sleep a little; you take a nap. You fold your hands and lie down to rest. Don’t overwork yourself either. Can’t sleep? Check out verses for sleepless nights. 13. Ecclesiastes 5:12 The sleep of a laborer is sweet, whether they eat little or much, but as for the rich, their abundance permits them no sleep. 14. Psalm 127:2 It is useless for you to work so hard from early morning until late at night, anxiously working for food to eat; for God gives rest to his loved ones. 15. Jeremiah 31:25-26 I will refresh the weary and satisfy the faint. At this I awoke and looked around. My sleep had been pleasant to me. 16. Matthew 9:24 He said, “Go away, for the girl is not dead but sleeping.” And they laughed at him. 19. Matthew 8:24 Suddenly a furious storm came up on the lake, so that the waves swept over the boat. But Jesus was sleeping. 20. Matthew 25:5 As the bridegroom was delayed, they all became drowsy and slept.